Here these minerals are used as accent pieces on floating shelves or decor tables. Commonly chosen are agate slices because of their beautiful complexities that are mesmerizing to any viewer. Also often used is crystal quartz because of its raw allurement. Paired with other natural elements, such as driftwood or greenery, this minerals become part of the elements in your own home. Mineral photography or art is a great way to bring in the intricacies of this trend, but also having the ability to move it around where ever you would like. Not to mention you can get some pretty stunning close up shots of geodes like this periwinkle and blue hued photograph. If you’re looking for something a little more bold and permanent, then you might try out some fabulous wallpaper that makes your whole wall look like a crystallized cave of stunning geodes. This boldly brings classiness to any space and in this case, is a match made in heaven with the copper and faux fur decor in this cozy bedroom. 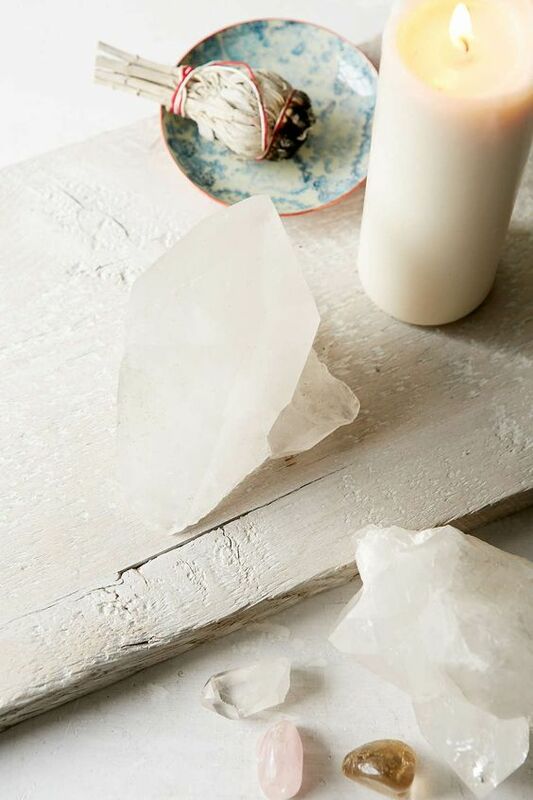 You certainly can never go wrong adding crystal quartz to any table top. Its simple raw beauty is unlike most, and can be incorporated into an abundance of styles without wavering their intentions. Don’t miss out on this lovely addition to your space. We hope you have a wonderful day and would love to hear about your thoughts on natural minerals in the home.